Dissolves the protein pellicle to which plaque, stain and bacteria attach without harmful bleaches or abrasives. Patented formula contains Calprox to whiten; baking soda for fresh breath and healthy gums; and ADA recommended fluoride to prevent cavities. Removes surface stains such as coffee, tea, tobacco, red wine, etc. 4.2oz tube lasts 3 months. Use twice daily for 2 minutes on a DRY toothbrush. Safe on bondings and veneers, bleached teeth, braces and even dentures. I have been using this toothpaste for about 5 years, it is expensive but it works better than any I have found at the drug or grocery store. it's toothpaste without the foaming agent. it cleans as well as you brush your teeth. i didn't find it to work any better than rembrant, which works as well as it can keep up with any smoking/staining habit. i never had any complaint with the overall colour of my teeth so much as a smattering of little dark stains that stand out, which did not fade in the least after a month of use.i did notice that one ingredient is sodium bicarbonate, aka baking soda, and so i went to the store and picked up a can for $1.50. with one brushing, all said dark stains were gone. the american dental association recognises baking soda to be safe with some added benefit to oral health, so i'll be using this in combo with a flouride toothpaste for the future.i'm sure there are people who found supersmile more effective than i, but i suggest saving yourself thirty dollars and buying a can of baking soda. I used to use the whitening strips. No more. Since I started using Supersmile toothpaste that is all I have used. My teeth are several shades lighter. I eat 1/2 cup blueberries every morning and drink coffee and tea every day. Supersmile Toothpaste keeps the stains away. 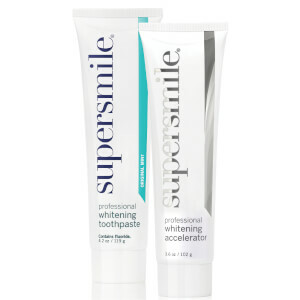 I've used SuperSmile toothpaste and the whitening accelerator for several years and do not plan to switch, in spite of the high price. Yes, it costs me about $35 per month but brushing twice daily really does whiten and keep my teeth their whitest, even though I drink tea, coffee and also smoke. This is remarkable. My one and only complaint is the tube is such thick plastic, it's very difficult to get the last bit out, resulting in some waste of an expensive product. Bought this together with the accelerating component; quite pricey for so-so results. It's better to get the set (they come out cheaper), and I've never run out of the toothpaste cause that tube is bigger. Anyway, I only use this toothpaste. I had a gap in my front teeth that was bonded, and what appealed to me about this product is that it whitens both regular tooth enamel and bonding resin. I can actually feel the grittiness/sand-like quality of regular toothpaste compared to using Supersmile, which is not good at all for the resin. Most importantly, it DOES whiten one's teeth amazingly well. It's even better if you leave the product on for like 10 minutes before brushing it off. The last time I had my teeth checked, they were actually whiter that the whitest shade on the shade chart. Also, it works even better after a teeth-cleaning I've noticed, so it's important to keep up with that. This toothpaste is good for whitening your teeth even if you haven't had professional whitening done. People would always comment about how white and pretty my teeth are. All I was using was supersmile stuff, and my dentist said she would not do a professional in office whitening on me because my teeth were white enough already! I love supersmile.